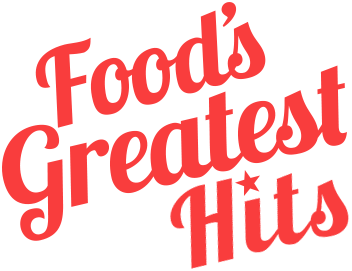 Today is officially the first day of fall - that means soup season!! We don't frequently dine on soup in our household, but when we do, it's always delicious and most often based on a fictional character. And now that it's finally fall, the only thing that truly works against the cold is a solid soup. 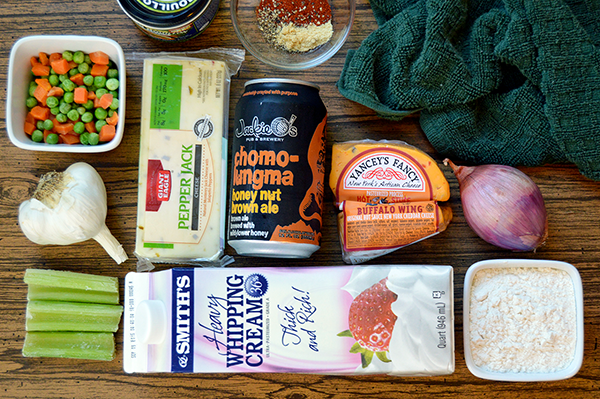 Fortunately, this simple recipe for beer cheese soup will warm you from the inside out. 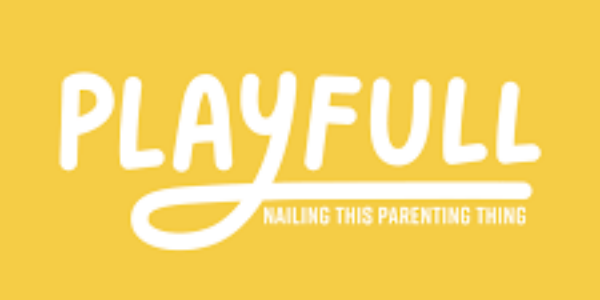 Most importantly, it's ready in minutes! A spicy soup is always a good soup, in my opinion, so I used pepperjack and buffalo flavored cheeses and then mellowed down the spiciness with heavy whipping cream. I decided to use Jackie O's chomolugma honey nut brown ale for my beer base as well, not only because it adds a rich, almost nutty taste to the soup, but also because it comes from the greatest place on Earth: Athens, Ohio. You can use whatever kind of beer you prefer, however. Begin by bringing your cheeses to room temperature, then cutting the cheese (ha!) into evenly sized cubes. Then in a soup pan, melt some butter over medium high heat. 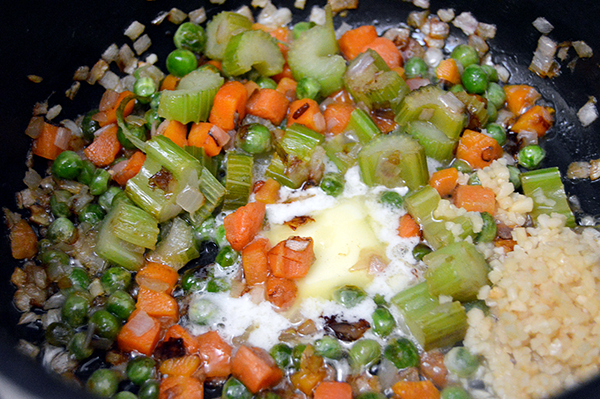 Add the celery, carrots, peas, garlic, and shallot to the pan. Stir occasionally as the pieces being to brown. 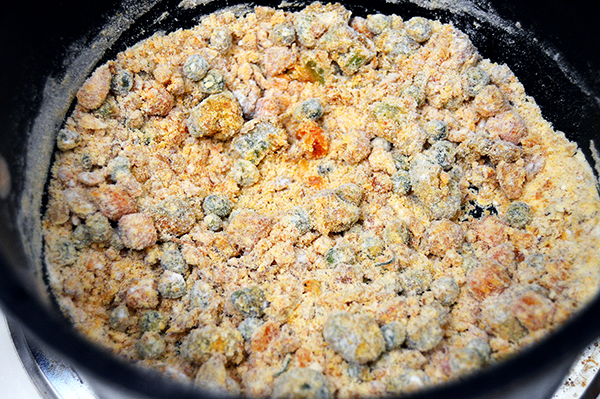 Next gently stir in the flour until all of the vegetables are coated. Then quickly add the chicken broth and stir until the flour has dissolved. Let the soup base simmer for about 5 minutes, then add the heavy whipping cream and cubed cheese. 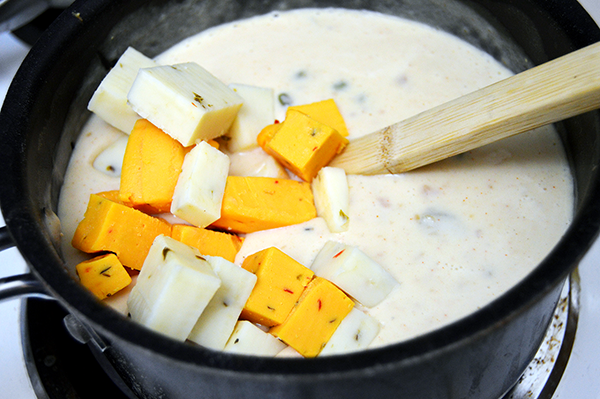 Stir for 2-3 minutes or until the cheese has completely melted into the soup. If the cheese is already at room temperature, it should melt fairly fast. Once the cheese is completely stirred into the soup, add the can of beer slowly or else you'll risk foaming over the top of the soup. Stir a few times then let simmer for about 5 minutes and reduce the heat to low. 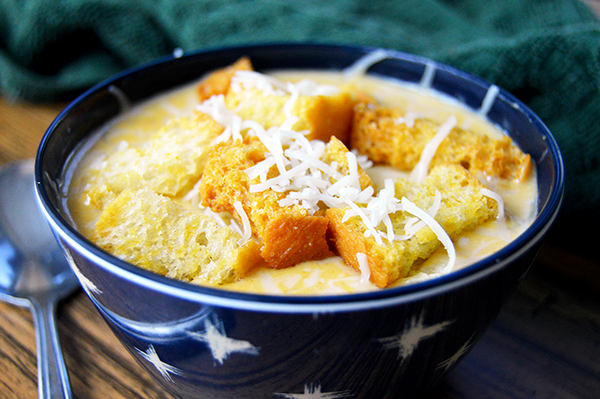 The soup will thicken the longer it stands, so serve it right away with some focaccia bread croutons and freshly grated white cheddar cheese. Bring the cheeses to room temperature. 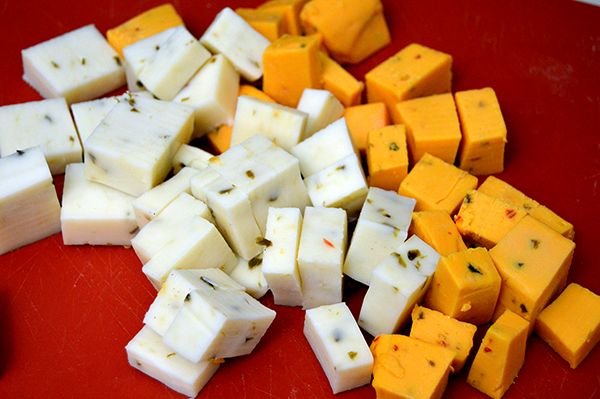 Cube the cheeses into roughly evenly sized pieces. Melt half of the butter in a soup pan. Add the peas, carrots, garlic, celery, and chopped shallot and sauté until just beginning to brown. Add the rest of the butter to the pan, followed by the flour - 1 tablespoon at a time. Stir until the vegetables are covered. Pour the chicken broth into the pan. 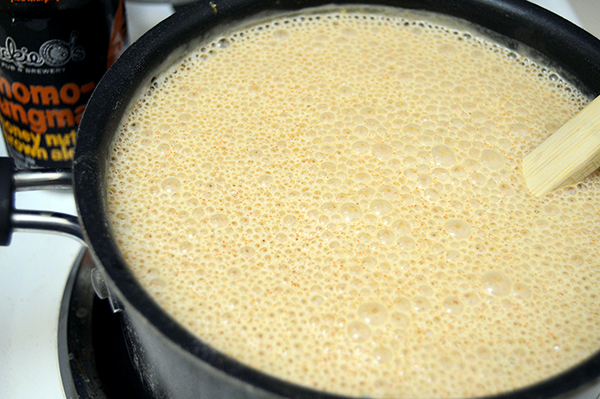 Stir until the flour is dissolved and a thick soup base has formed. Simmer for 5 minutes. Reduce the heat to medium heat and add the heavy whipping cream. Then add the cheese, a few cubes at a time, to the base. 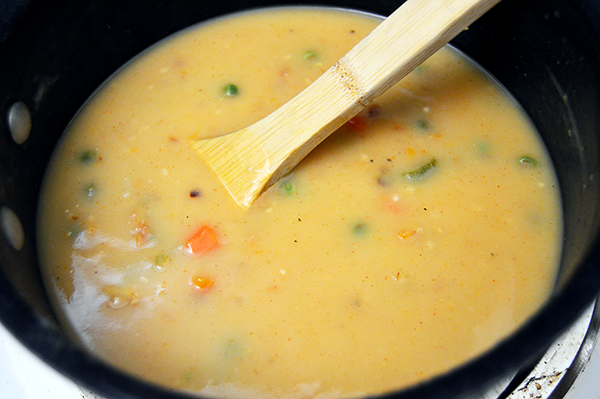 Continue to stir until the cheese has completely melted into the soup. Slowly pour in the beer, stirring to incorporate. Take care not to pour to fast and create foam that might overflow. Reduce the heat to low and let the soup simmer for an additional 5 minutes. The soup will begin to thicken as it cools. 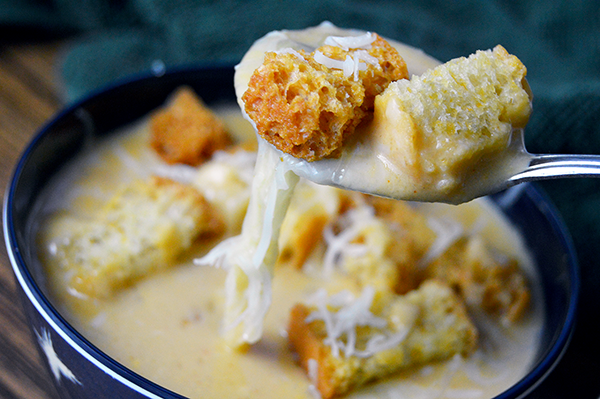 Serve right away with croutons and freshly grated white cheddar cheese. Enjoy and stay warm!